Press Releases: Learn about our latest developments and innovations with our recent press releases. 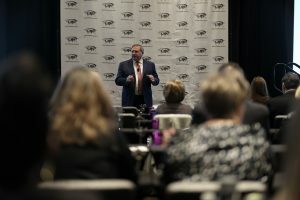 Steven Wester, President of Global Mobility Solutions, addressing attendees at the company’s 2019 Partner Forum. SCOTTSDALE, AZ, USA, April 23, 2019 – Global Mobility Solutions (GMS), the industry leader in corporate relocation services and technology, is pleased to announce that Relocate Magazine has placed GMS on the shortlist for this year’s Technological Innovation – Corporate Support Award in their twelfth annual Relocate Awards. GMS continually improves and evolves its industry-leading MyRelocation™ technology platform, challenging the relocation industry to keep pace with clients’ needs. The GMS approach is guided by a client panel with input from transferees to understand what is important to them for their relocation technology. By listening to clients, investing in innovative technology, and providing the industry’s best customer service, GMS has become the relocation industry’s leader. The Relocate Awards from Relocate Magazine were launched in 2007 as the first awards program for the global mobility and relocation sector. The Relocate Awards recognize excellence, celebrate the contribution of relocation to business, and reward best practice. Winners will be announced at a Gala Awards Dinner on Wednesday May 15 at the St. Pancras Renaissance Hotel in London, UK. For more information about Relocate Magazine, please visit www.relocatemagazine.com. For more information about Global Mobility Solutions, please visit www.gmsmobility.com. Founded in 1987, Global Mobility Solutions (GMS) is a global corporate relocation services company that specializes in workforce mobility and relocation technology. The company’s corporate relocation programs include global assignment management, domestic relocation management, and a wide range of pre-decision services. In the early 1990’s, GMS was the first relocation company to register as a .com, created the first online interactive tools and calculators, and revolutionized the entire relocation industry. GMS continues to set the industry pace as the pioneer in innovation and technology solutions with its proprietary MyRelocation™ technology platform. GMS is a perennial winner of the HRO Today Baker’s Dozen customer satisfaction survey, being recognized as a top relocation company for the last six consecutive years. Global Mobility Solutions™, MyRelocation™, and the Global Mobility Solutions logo are trademarks of Global Mobility Solutions, Scottsdale, AZ, USA. GMS pre-decision services are designed to assist companies with selecting candidates best suited to relocate. Candidate assessments, market analysis, and cost estimates are just a few relocation services GMS provides to ensure successful placement. Global Mobility Solutions provides award-winning services to make managing your corporate relocation program easy and cost-effective. We guide your mobile employees through every step of their move so that they arrive at their destinations on time, relaxed, and ready to work. Global Mobility Solutions helps you overcome the unique challenges of global corporate relocation. By providing services like virtual spotlights, language and cultural training, immigration and visa solutions, and more, GMS ensures that you get the right talent in the right place for the right price.